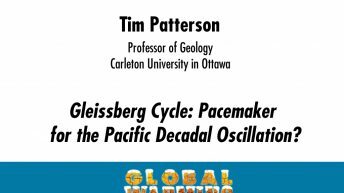 Tim Patterson is professor of geology at Carleton University in Ottawa and a senior visiting fellow in the School of Geography at the Queen’s University of Belfast. 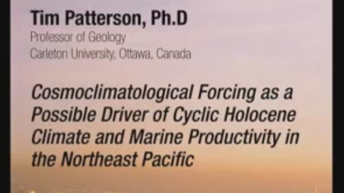 Patterson’s research emphasizes the dynamics of climate and sea-level change through the past few thousand years. 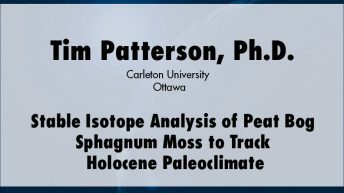 In this capacity he also serves as Canadian leader of UNESCO International Geological Correlation Program (IGCP) Project 495 “Quaternary Land-Ocean interactions,” which is mandated to study the record of sea-level change past and future. He has been principal investigator for projects of the Natural Science and Engineering Research Council of Canada (NSERC) and Canadian Foundation For Climate and Atmospheric Sciences (CFCAS), examining high-resolution climate records from marine basins off the west coast of Canada. He was a founding editor of the journal Palaeontologia Electronica and is presently associate editor for the Journal of Foraminiferal Research. He has published 125 articles in peer-reviewed journals and was the recipient of a 2002-2003 Carleton University Research Achievement Award. He also has presented professional briefings to Canadian government staff and the Parliamentary Standing Committee on the Environment and Sustainability.